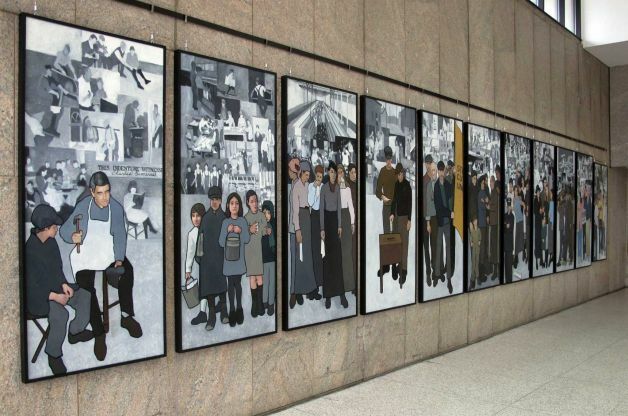 Five years ago, in 2008, Maine artist Judy Taylor completed a 36-foot, eleven-panel mural depicting the history of labor in our state, which was then displayed in the lobby of the Maine Department of Labor in Augusta. And there it sat until March 2011, when our blustering illustrious governor decided he didn’t like its pro-labor message and had taken from the walls of the Labor Department. Gov. LePage received an anonymous letter signed by a “secret admirer” who sputtered in outrage at the presence of pro-union, Communist North Korean-style propaganda adorning the walls of a government building. This right-wing mouth-breather’s heartfelt plea for the state government to embrace reactionary anti-union paranoia resonated with LePage’s “Solidarity for Businesses and the People Who Own Them” agenda, and thus Dear Leader declared the mural objectum non grata in the very building it was commissioned to adorn. It was a nasty if pathetically impotent attack on the labor movement, and it seriously pissed off quite a lot of Mainers. Of course, it ended up backfiring completely on LePage: he made himself look like an obnoxious, bullying despot, the issue became a distraction for his administration and a rallying point for his detractors, and the mural became famous, celebrated – beloved, even – and is now prominently displayed in the Maine State Museum. AUGUSTA, Maine — Nearly two years after Gov. 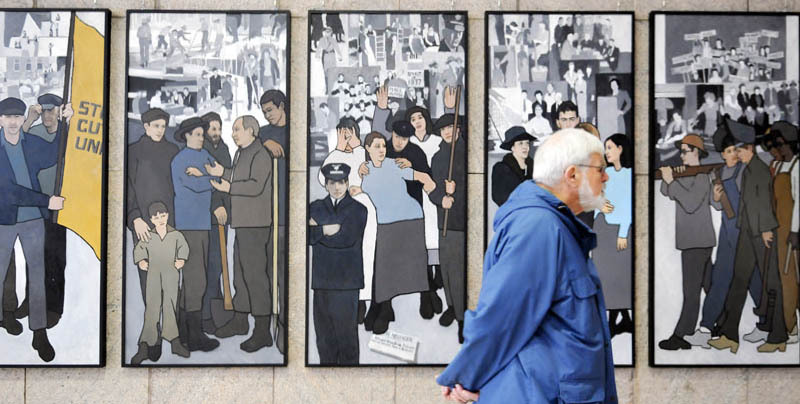 Paul LePage had a mural depicting Maine labor history removed from the lobby of the Department of Labor building, the artwork resurfaced Monday at its new home: the Maine State Museum. 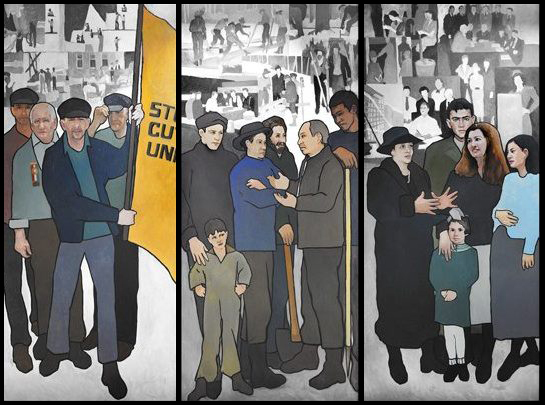 Labor Commissioner Jeanne Paquette and Maine State Museum Director Bernard Fishman unveiled the Maine Labor History Mural in the atrium ofthe state Cultural Building in Augusta, which houses the museum, the Maine State Library and the Maine State Archives. 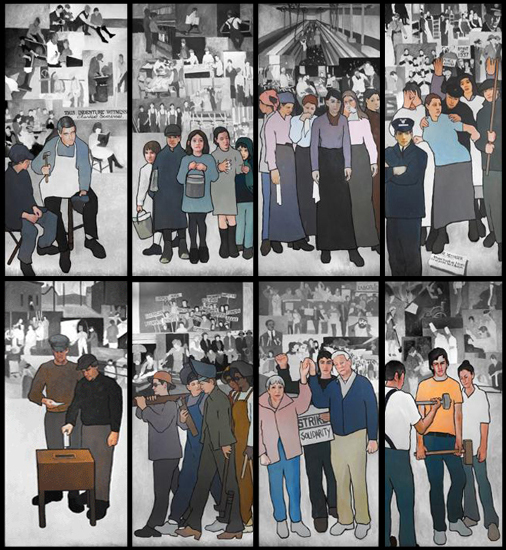 The Department of Labor has loaned the mural to the Maine State Museum for three years. Fishman, the museum’s director, said Monday that museum staff and others would work to find the artwork a permanent home during that period. The mural’s final home might be the museum, he said, but that would require some renovation. This is a satisfying victory, and even if the resolution is quiet and a bit undramatic, it’s a wonderful outcome. LePage failed, and the things he attacked came out stronger. It still doesn’t make up for that fact a bullying little puke is our governor, but it’s a nice offset to the damage he’s done to our state.